As noted in my headline, the Chicago Fire simply lit the fireworks with the youngster Harry Shipp leading the way; good for him and well done, son! As for the new leader in Montreal--and ex-Fire coach--things weren't quite as rosy. You'll recall early last week I published this article on MLS Coaches - showing statistics, not pure speculation, on which coaches have teams that aren't performing to standard in MLS at this time. Frank Klopas was one of those Head Coaches mentioned, and sadly his team was the only team in the bottom four of that list who didn't win this past weekend. But back to Chicago. They didn't take the PWP Attacking Team of the week by much; Sporting KC was a close second while Cabrera and the Goats were 3rd best and New England rounded out the top 4 with that blowout against Seattle. PWP Attacking Player of Week #10 - Harry Shipp - surprised? Not likely, for only the second time this year my PWP Attacking Player of the Week was the same as the MLS Player of the Week... as odd as it may sound I take pride in my PWP Players of the Week not matching those from MLSSoccer.com. Duly noted that some players had some superb passing statistics in this game; here's a diagram of all the successful passes for Sporting against a hapless Montreal side... and even more intriguing is this diagram (also from the OPTA Chalkboard) of all the unsuccessful passes by Sporting. WOW! Not sure I've ever seen so sparse a chalkboard as that for unsuccessful passes! In looking at the defensive side of the pitch Montreal offered up 45 total passes in the Sporting defending third - of which nine were throw-ins... in the area here (just atop the 18 yard box) Montreal had 5 unsuccessful passes and 3 successful passes with two of those successful passes being throw-ins. Moving on... 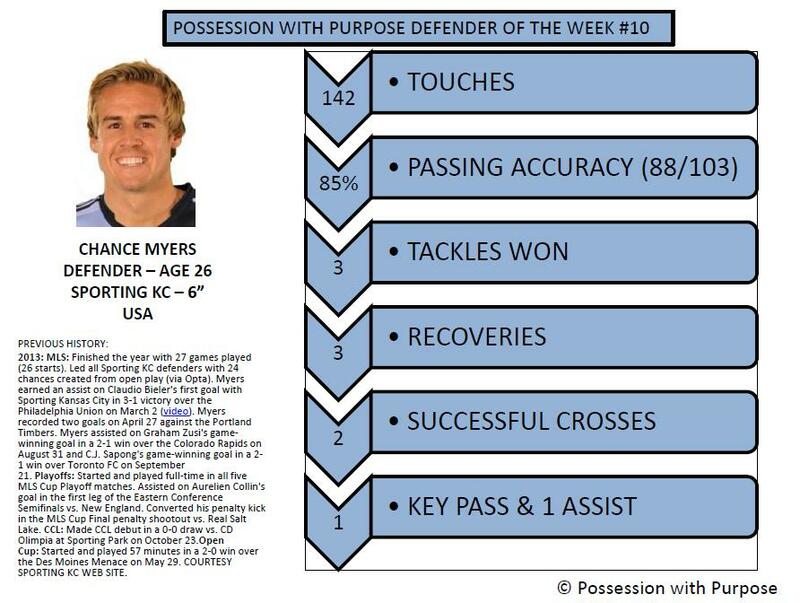 So this week who's top and who's not in Possession with Purpose after 10 full weeks of play in MLS? Last year's Champion has finally reached the top spot; will they be able to hold on? I don't know, but still-unbeaten Real Salt Lake has shifted from 7th to 4th this week. 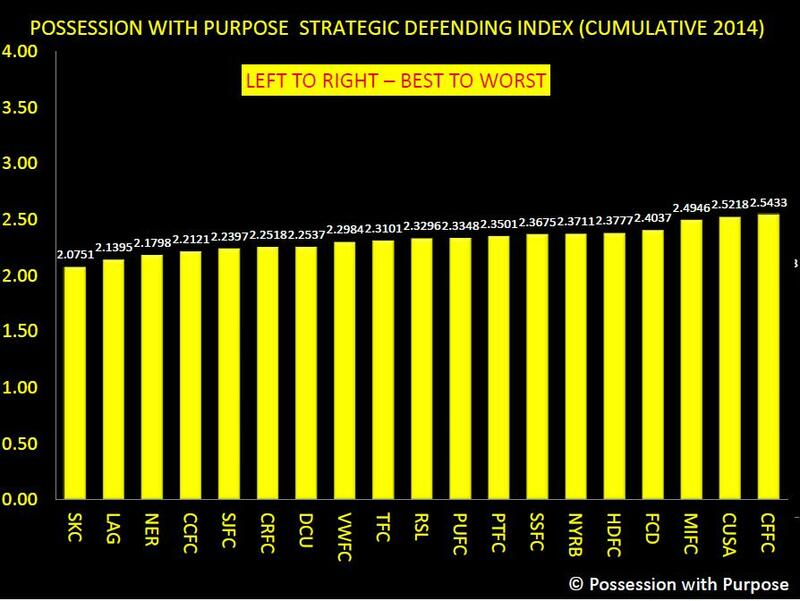 With respect to the bottom teams in this Index - there is no question that the worst performing team in MLS is Montreal. 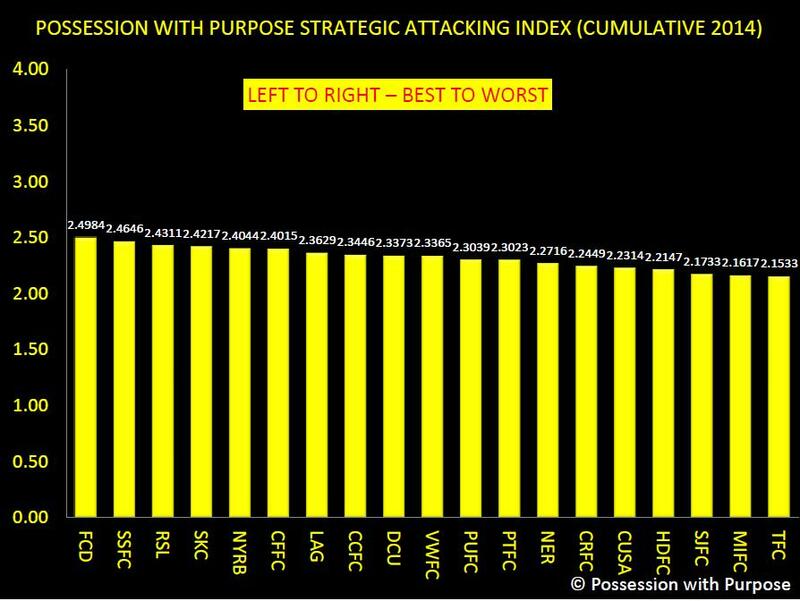 I'm not sure how anyone can consider their pathetic team output - across all categories measured - anything other than worst. Chivas got a notable win, but one win does not a streak make - falling a bit further this week was Toronto - moving from 6th worst to 4th worst. Are some other teams in MLS catching on to that 'mistake driven' football that Nelson might be working towards? However, small movement is still expected given that a number of teams will be without some key players for at least 5 weeks - we can hope for more for the USMNT's sake. In looking at the diagram what the last place team offers is that the opponents of Chicago Fire, by and large, possess the ball, pass the ball, penetrate with the ball, take shots with the ball, and score with the ball more than Chicago does... if that trend continues it is likely that Chicago will have a very poor record by the end of the season. 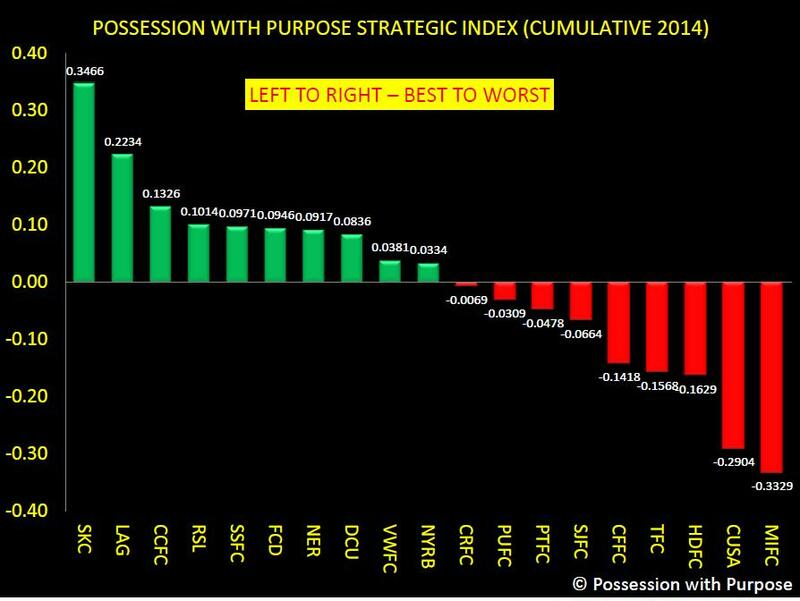 In considering Philadelphia for a minute - they are in the bottom half but they are not being dominated by their opponents - sometimes games won and lost or drawn end up being more about a single mistake or... multiple mistakes as opposed to poor team performance. It's data like this that tells me, as an analyst, that Hackworth has a reasonable system and plan - its' just not working because something on the pitch is broken.